Hey Ya’ll! Most of you are officially back in school and if you’re not, then you are about to start. Over the past several weeks I’ve gotten several questions from first year teachers asking for advice. I was a first year teacher not long ago. I remember how scary and exciting it can be all at the same time. After 5 years under my belt, I definitely am no where close to having all the answers but I have learned a lot about myself as a person and as a teacher during that time. If I could give a new teacher advice, here is what it would be. Don’t be afraid to be yourself. I quickly learned that in the world of education there is always going to be someone who doesn’t like something that you do. You are going to have to grow a thick skin and you are going to have to do that quick. Lets talk coworkers…A coworker might not like how you teach or the way you run your classroom management but that is ok. Sometimes they will share their opinions with you and other times you might over hear it through your classroom walls (yes that might happen, yes it will hurt your feelings, shake it off and go on with your day). 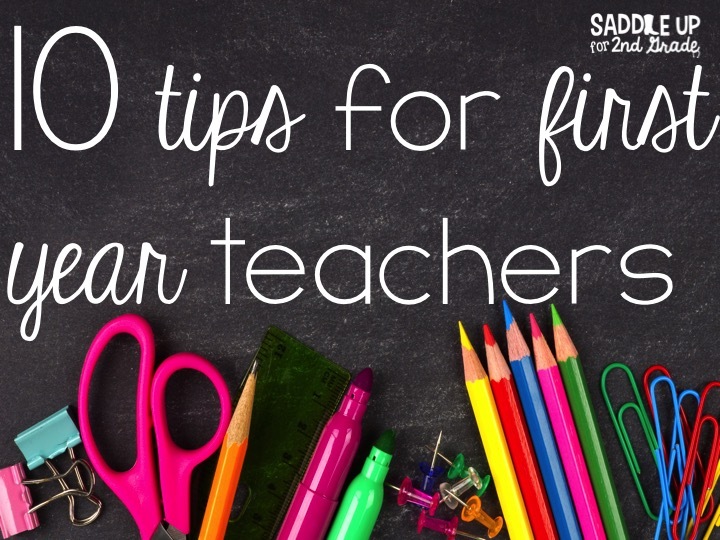 Just because you have a different teaching style than your coworker doesn’t make you a bad teacher. Share your opinion. Just because you new doesn’t mean that you aren’t entitled to share how you feel. What works for you and your students might not work for someone else. Find YOUR teaching style and what YOU like and go with it. Who cares if your coworker doesn’t like it! You will quickly learn what is best for those kids and how they learn. If that means putting on a silly song and dancing around like a goof ball, DO IT! 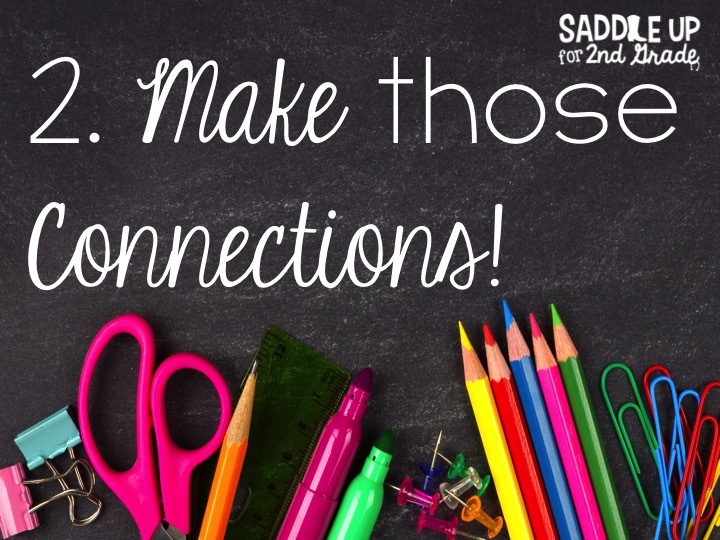 Making connections with your students is one of the most important things you can do. Get to know each one of them. That means going beyond knowing how they are doing academic wise. Get to know what their hobbies are, what they do after school, what their likes and dislikes are etc. One thing I do is try to attend their events outside of school. I go to their basketball and little league games, dance recitals, church performances and so on. Make it a point to talk to each kid individually every day. Hug on them. Joke around with them. Show them that you care. Most of the time, you are the only positive role model they have in their lives. Lets talk parents…First off, those parents are just as nervous to talk to you as you are to talk to them. Some will be super supportive and others will think you have no idea what your talking about. Always be open to what they have to say, even if you disagree with them. Admit it when you are wrong about something. Work together to come up with a solution to the problem together. Let those parents know that you are there to do what is best for their child. I know that I have become a good teacher not because of test scores but because of the relationships I’ve built with parents and students over the past five years. One of the kids I taught my first year still writes me a letter every summer. 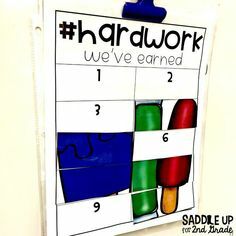 I’ve had parents from students that I taught at 2-3 years ago message or e-mail me thanking me for what I did for their child. I make it point to continue those relationships. They don’t stop just because they aren’t in my classroom anymore. Those kids will always be part mine. I took the time to make those connections and that is the biggest reward you can take away from this job. This is a big one ya’ll. This is one of my favorite quotes. Everyone has to start somewhere. It takes time to find your teaching style, develop a routine, and build your classroom. I’ve been teaching for 5 years and still am no where close to figuring it all out. It is hard not to compare yourself to others on your campus or to what you see online. 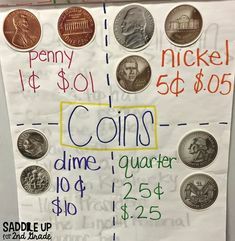 Just remember, those pinterest classrooms all had to start somewhere. Take your time to develop relationships and establish connections. 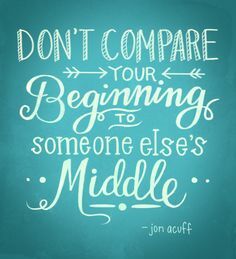 Don’t compare to yourself to other teachers. 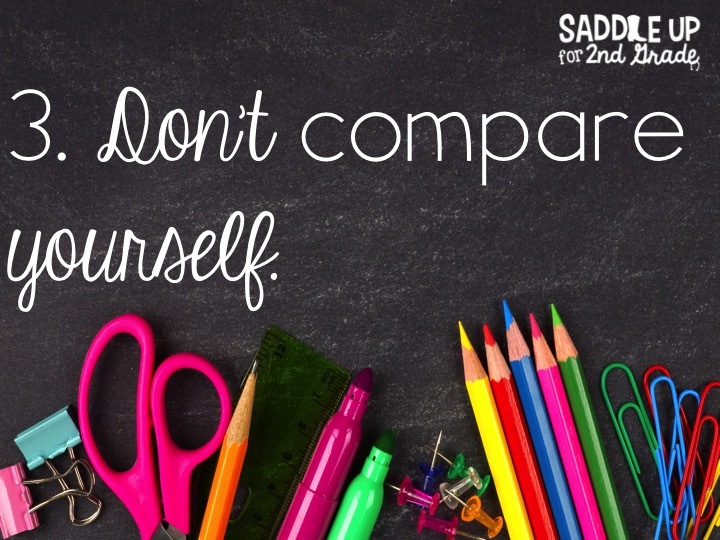 Don’t compare yourself to teacher bloggers. Don’t compare yourself to others. 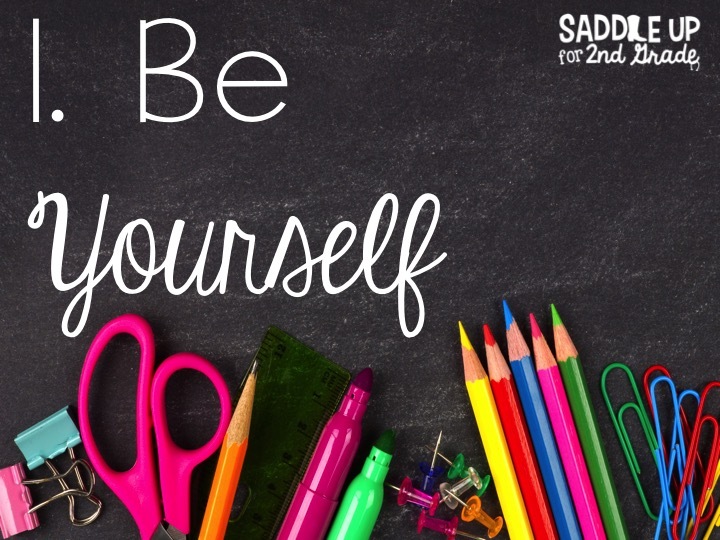 BE YOURSELF! 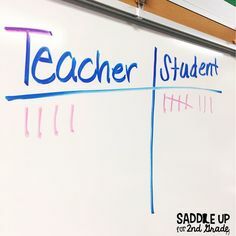 There is always going to be that one teacher on campus that is in everyones business. There is always going to be someone who doesn’t like the way you teach. There will always be that teacher who will try to tell you what to do or boss you around because you are new. Don’t let that happen. Thick skin remember. Take the time to form your own opinions about people you work with and students you get. 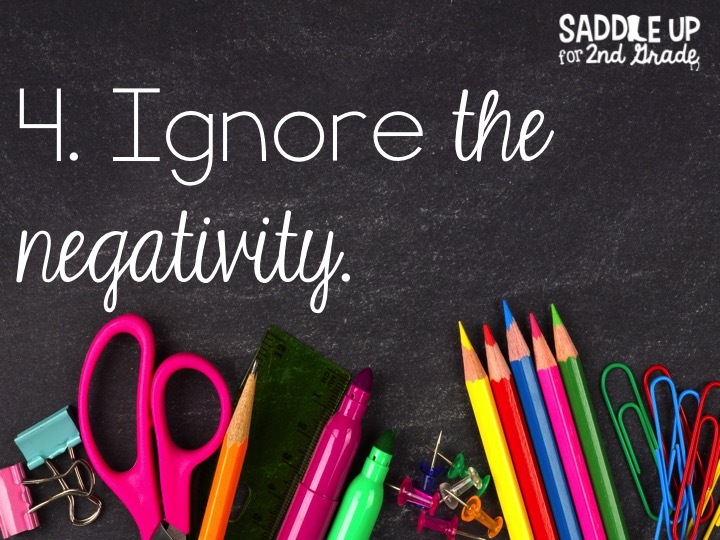 Ignore the coworker that doesn’t like your classroom management practice or the way you teach. Letting those kinds of people under your skin is what they want. Show them that you are better than that. Do your own thing and be AWESOME! As a teacher, you should always be willing to learn more and improve your teaching methods. 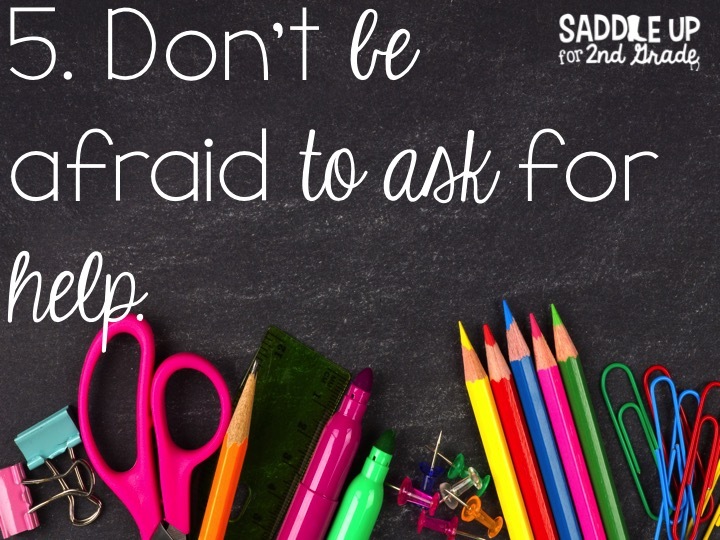 Do not be afraid to ask for help. There are going to be times when you feel at a loss. You will feel like you have failed those kids because they just aren’t getting something. There will be a time when you have a student with behavior issues and everything you’ve tried isn’t working. It is ok to ask for help. It is ok to not know what to do. Build relationships with you coworkers. Find that person you can talk to. My first year teaching, I had the best teaching mentor. She taught in the room right next to me and our rooms were connected by a bathroom. I don’t know how I would have survived my first year without her. I can’t tell you how many times a day I would walk into her room and say I need your help and we would talk it out. When I left that school, I was heartbroken because I was leaving her. At the next school I taught at, my co-teacher became like my second mom. There was a large closet in between our rooms and that was our meeting spot. Sometimes I would just open her door or she would open mine and we could just tell by the look on each others faces that we needed to talk to each other. Sometimes during the day you need that mental break, even if it is just for 5 minutes. 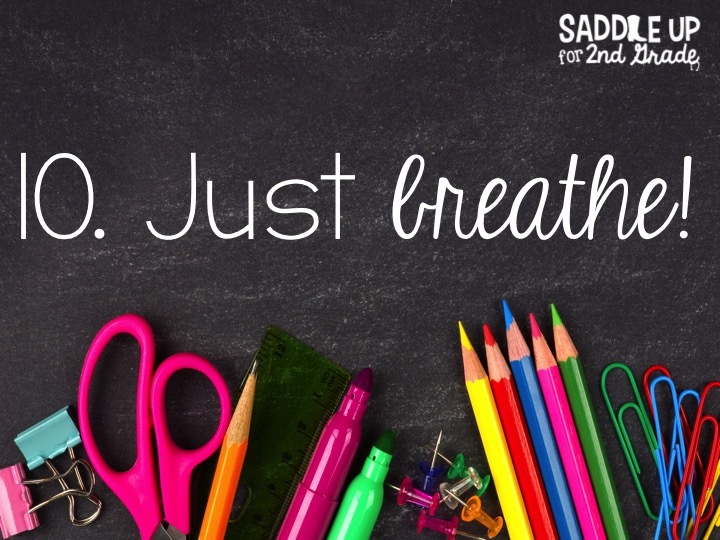 Let the kids read, color or even talk and take a moment. Take time to develop those friendships with you coworkers or your principal. No question is ever a dumb one. If you don’t know how to teach something. Ask for help. 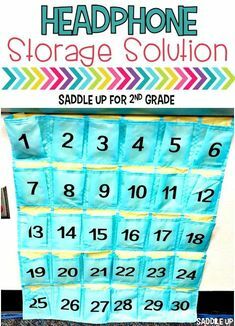 If you’ve tried everything to get your class to settle down. Ask for help. If you don’t know how to run the new grade book system. ASK FOR HELP! Have you asked for help and your still stuck? Turn to YouTube. Yes, I said YouTube. 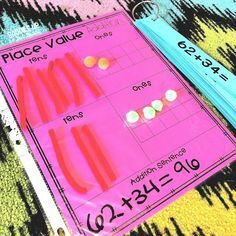 Search “how to teach addition with regrouping” and you’ll get TONS of videos with several different methods. Search pinterest, read blogs, e-mail a teacher blogger, shoot e-mail me and I’ll try to help if I can. The important thing is to know that you don’t have to do this alone. You don’t have to learn on your own. ASK FOR HELP!!! I hate to tell you this but you are going to mess up. You are going to mess up more than once. I’m also going to tell you that it is OK! Sometimes you’ll be in the middle of a lesson and realize that you’ve said the wrong thing or even taught something the wrong way. Sometimes the kids will catch on, and if they do they will correct you. Laugh it off and go with it. It shows them that it is ok, even for their teacher to make mistakes. You are not perfect, you are never going to be perfect, so why try to be? Make a scheudle. By this I mean, make the most of your conference time. Our job is overwhelming. We don’t just sit around and color all day. 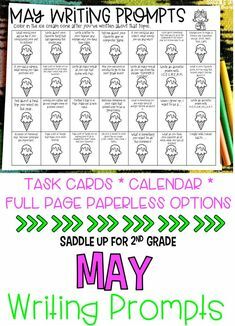 We have to plan our days, make copies, go to meetings, grade papers, fill out paper work, etc. I’m sorry but you can’t get all of that done on your 45 minute conference period. You just can’t. 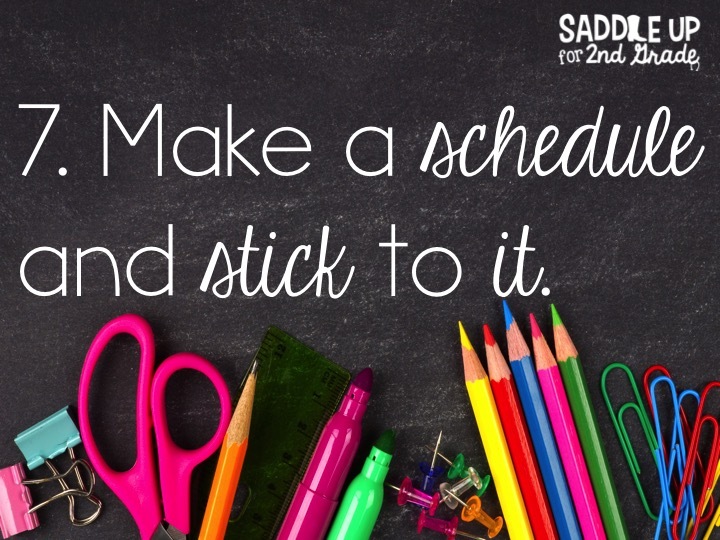 Set up a schedule for your planning period and stick to it. Do one thing at at time. For example, on Mondays you meet with your partner and plan the next week. On Tuesday you plan your lessons. Wednesdays, you are going to make copies. Thursdays, you are going to file paper work. On Friday, you are going to grade papers. If you try to do all of the above every day during your conference time, you won’t ever get much accomplished. Do one thing at a time and get as much done as you can. Make the most of your conference time so at the end of the day you can go home and enjoy your family. 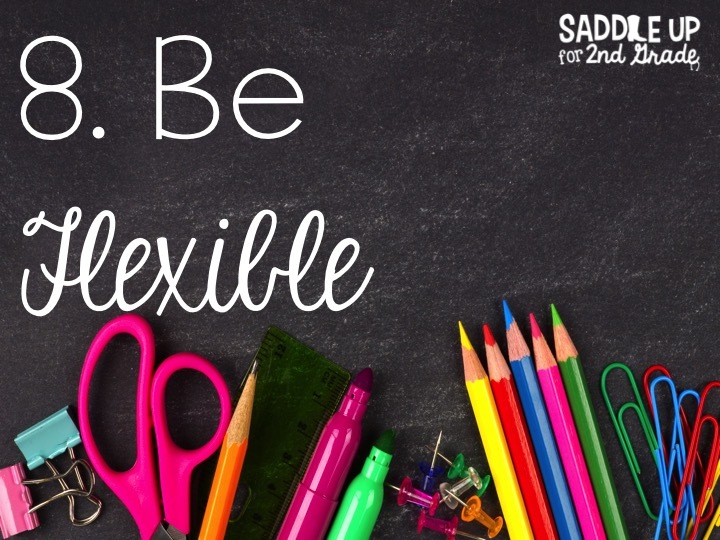 Now with all of that being said, you have to learn to be flexible. That schedule you have set in place will sometimes get messed up. You will have unexpected things happen throughout your day and you just have to go with it. 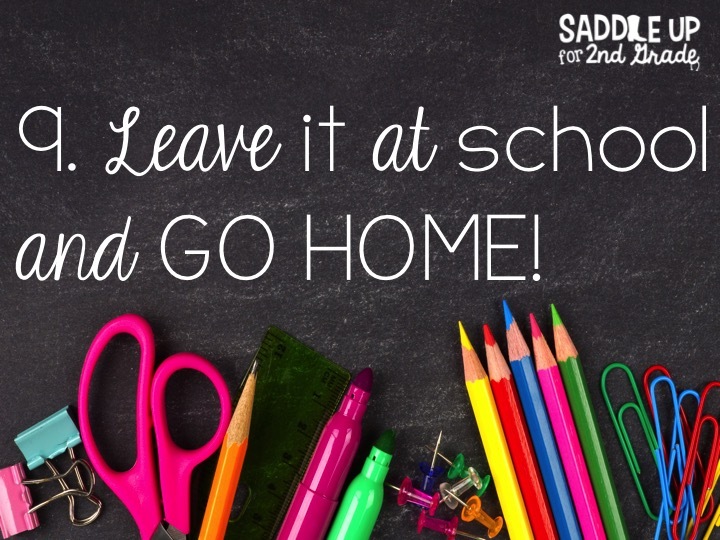 Sometimes a child will get sick during the middle of a lesson and you have to stop. Sometimes a parent will show up or an unexpected meeting will be called during your conference time. 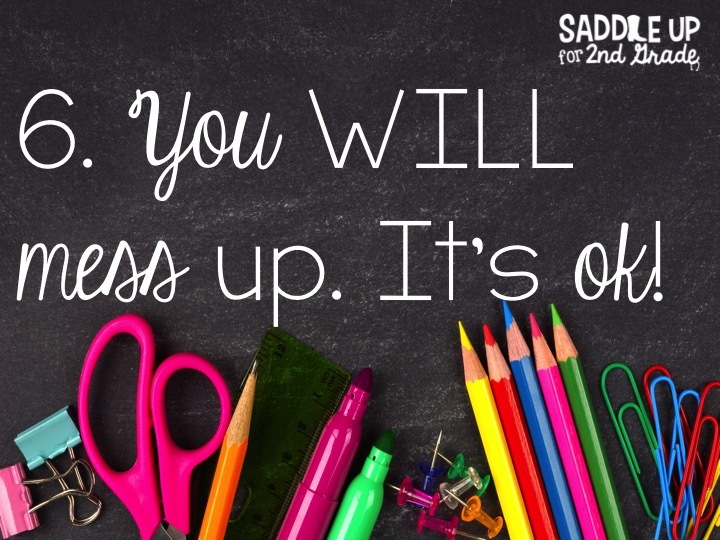 You will have fire drills, pep rallies, class birthday parties and so on. It is ok. Your day isn’t going to go exactly how you have it planned in your lesson plan book. Pick up where you left off the next day and keep going. This is something I think every teacher struggles with, including myself. Yes there are some days you are just going to be at the school late. It happens to all of us. 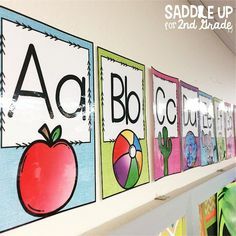 You need to know that it is ok to leave that stack of ungraded papers on your desk and just go home because lets face it, you are going to throw them in your teacher bag, go home and turn on Netflix and not even touch them. Make a point to get as much done during the day as you can and go home when you are allowed to leave at least 2 days a week. Start there. Leave the mess on your desk. Leave the ungraded papers. Leave your lesson plan book. GO HOME!!! Turn on Netflix and watch 4 episodes of The Walking Dead (my obsession) or your favorite show. Go for a run or take your dog for a walk. Go out to eat with your family. Read a book…for ENJOYMENT! As teachers, we get so wrapped up in our jobs that we often loose the time to do the things that make us ourselves. We don’t do what we love to do because we are so worried about those kids we see for 8 hours each day. Take the time to still be yourself. The stress and worry can wait. Trust me. Just breathe. You are going to have days where you want to give up. There will be days when you come home and cry. There will be days that you come home and need a strong drink at 5:00. BUT there will also be good days. Days where everything goes perfectly. Days where that one kid finally has that light bulb moment. Those days that remind you why you became a teacher. Breathe through all of those tough movements and know that all of the good outweighs the bad. Don’t burn yourself out too quickly. Those kids need you and you might not realize it but you need them too. Enjoy those moments you have with them because you will cherish them forever. If you are 22 and starting your first year or 40 and starting your first year after changing carriers, I wish you all the best of luck. Education is the most rewarding profession. It has its ups and downs but know those good moments are worth it all.